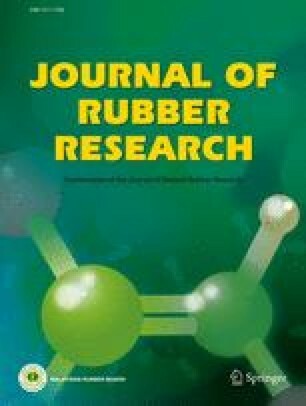 In this study, natural rubber latex was prevulcanised at two different temperatures i.e. room temperature (PVRT) and at 60°C (PV60). Mechanical properties of the dried films were measured. The effect of different sulphur levels on mechanical properties of the films were evaluated. The tensile modulus at 300 % elongation (M300) increased when sulphur levels rose from 0.25 p.h.r. to 0.75 p.h.r. and 1.50 p.h.r. However, when the sulphur level rose to 2.00 p.h.r. there was no further increase in tensile modulus of both PVRT and PV60 films. An increase in sulphur level resulted in better tensile strength of the films. Conversely, tensile strength of the films can be influenced by either prevulcanisation and drying processes or the leaching treatment. In this study, transmission electron microscopy was used to visualise the nature of crosslinking in the films where, homogenous intra-particle crosslinked regions were observed in each rubber particle. It is found that, PVRT films possess higher inter-particle crosslink density compared to PV60 films, which is believed to enhance tensile strength. The sulphur-probe treatment indicated that, most of the inter-particle crosslinks are poly-sulphidic crosslinks.